Following on from our last post about mapping #Kony2012 on Twitter, we also wanted to offer up a map that shows the proportion of tweets from each country that made reference to the viral video or the LRA leader (or both). We've already seen that most tweets referencing Kony were published from North America, and Western Europe, but this map tells a slightly different story. We now see that despite the very low total amount of content coming out of Sub-Saharan Africa (see the map below or read this post about where tweets come from), there is indeed a significant amount of focus on the Kony issue there. But it remains that this is still a discussion that was largely taking place online in the Global North. While the top five countries in our sample (20% of all georeferenced tweets between March 5 and March 13, 2012) are: (1) USA; (2) Brasil; (3) Indonesia; (4) UK; (5) Mexico; and (6) Malaysia, the top five in terms of tweets that reference #Kony are: (1)USA; (2) UK; (3) Canada; (4) Brasil; and (5) Ireland. In other words, we see that while Twitter itself contains a lot of voices from the South, the discussion of Kony and Invisible Children remained firmly in the North. Thank you all for your interest in SheepCamp. We are now officially announcing this is a reality. 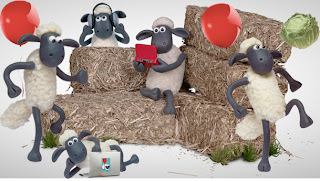 Pack your laptops, sleeping bags (not necessary but feel free to bring one), and data as Sheep Camp 2012 will be held on the University of Kentucky's campus on June 15-17. We will be meeting in Keeneland Hall, a residence hall at the university that has recently been renovated with meeting spaces, high speed WiFi and break out rooms. Attendees will stay in dorm rooms (single occupancy) with a shared bathroom with one other room. The cost is $26 per room per night and we ask non-students to contribute to this cost if possible. Graduate students will have their lodging covered. We're also hoping to cover a lot of the travel expenses for graduate students as well but to be eligible for this please contact Matt at zook@uky.edu. Note: The exact topics will be developed by the participants over the next several weeks. But the general idea is to set up a research agenda for using and analyzing user generated geo-coded content. 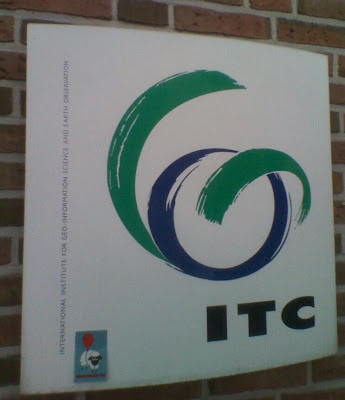 Group activity / Group presentation. We've been in contact with most of our confirmed attendees (who registered an expression of interest), but if you are interested in joining us and haven't been in touch, please email zook@uky.edu. Some of our work just got picked up by the Brazilian magazine Exame. The spread offers an alternate visualisation to the data that we're collecting about the geographies of Wikipedia. It also includes penguins. 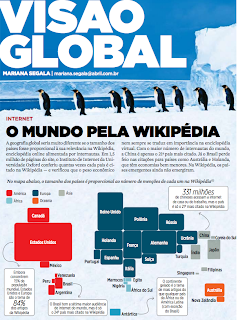 None of us speak Portuguese, so we're not sure what the penguins have to do with Wikipedia. But, being the purveyors of sheep that we are, who are we to talk? A PDF of the piece is here. Check out the new video produced by the UK College of Arts and Sciences of Matt, Monica and Ate talking about the IronSheep 2012 event. p.s. It's not our fault Matt's name is spelled wrong. During IronSheep we played a series of sheep videos in the background to provide a certain "ambiance" to the event. It seemed a waste not to share them so here they are (along with a few other videos we've since discovered or been sent). 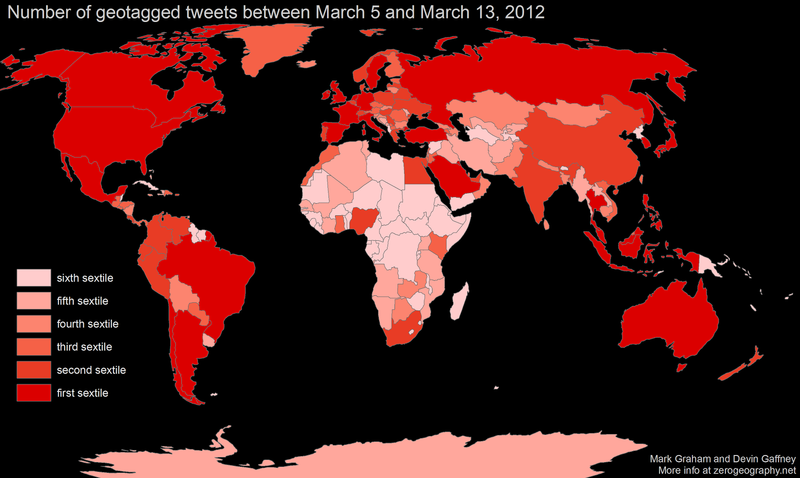 Last week, we posted a map of all georeferenced tweets mentioning the #Kony video. The patterns were interesting, but not entirely unexpected. A more interesting question though, would be to see what percentage of all tweets from each country reference #kony, in order to get a better sense of how focused people were on the event. However, to do that, we need to figure out how much content in Twitter actually comes from each country. The bar chart shows us the degree of inequality in where this content is coming from: with people in a few countries producing the bulk of content, and then a very long tail of countries from which very little content is produced. Only two of the countries on that list are in the Global North and traditional hubs of the production of codified knowledge. What does this all tell us then? It is possible that Twitter is truly allowing for a 'democratisation' of information production and sharing because of its low barriers to entry and adaptability to mobile devices. However, we need to do more work in this area to really figure out where content is coming from in the platform. Our sample in this post was limited, and more importantly we are still only dealing with georeferenced tweets that make up less than 1% of the total content that passes through the platform. An interesting start nonetheless. **We'll post the Kony map normalised by the number of tweets in each country soon. The other day when looking for a larger version of the Beer Belly of America map, I happened across a map that we made back in the early days of the blog in which we compared references to bars, bookstores, bowling alleys (an oblique nod towards Putnam) and adult entertainment. For some reason, this map never made it on to the blog, but is worth revisiting. In it, the colors represent which of the four search terms was most prevalent at any location. 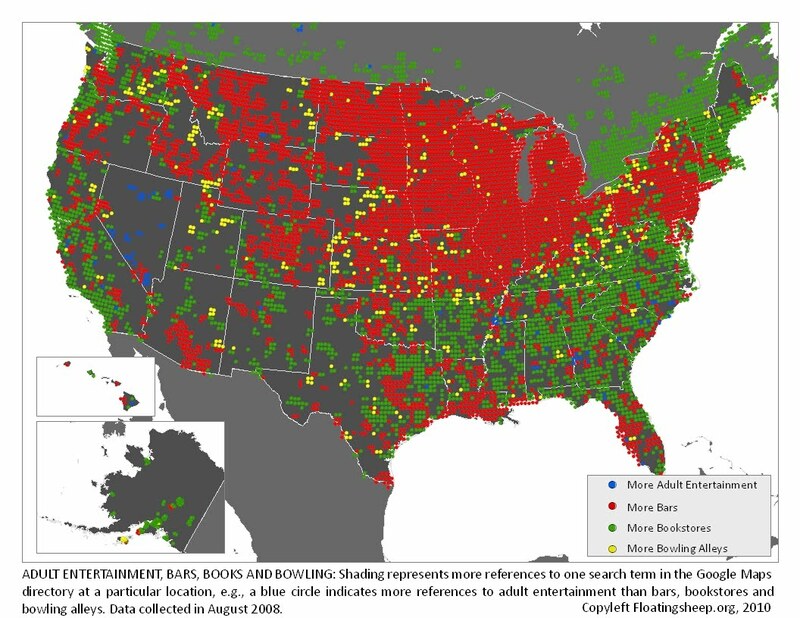 A green dot means there were more bookstores, a red dot indicates more bars, yellow shows more bowling alleys and blue marks places that had more references to adult entertainment than the other three categories. The pattern of more bars than anything else shows up solidly in Montana, the Dakotas, the Midwest and parts of the Northeast, with the exception of New England, which is interspersed with a sprinkling of places with more bowling alleys. In contrast, much of the southern U.S., particularly the Southeast, has many more references to bookstores than to the other search terms. As this is a relative measure, this does not indicate there are more bookstores in the Southeast than the Midwest but that there is a greater number of bookstores relative to bars in this region. Also interesting is the clusters of more bars along the Gulf coast (Texas, New Orleans and Florida), as well as the southern half of Arizona. This suggests that these parts of the southern U.S. have a different relationship with bars than much of their surrounding areas. Lastly, the pattern of adult entertainment shows that Nevada represents a very different milieu than the rest of the U.S. The only other points in the U.S. where adult entertainment exceeds the other categories are predominantly rural areas in the Southeast and the central valley of California. A LOT has been said about the recent Kony 2012 video. There have been critiques, critiques of critiques, critiques of critiques of critiques. Interestingly, there were many claims that video was one of the most successful viral campaigns in the history of the Web. In other words, the campaign was able to rapidly spread, in part, because of millions of people sharing it through social media. And yet, we still haven't seen is any sort of time/space mapping of how the campaign spread. So, we decided to do just that. 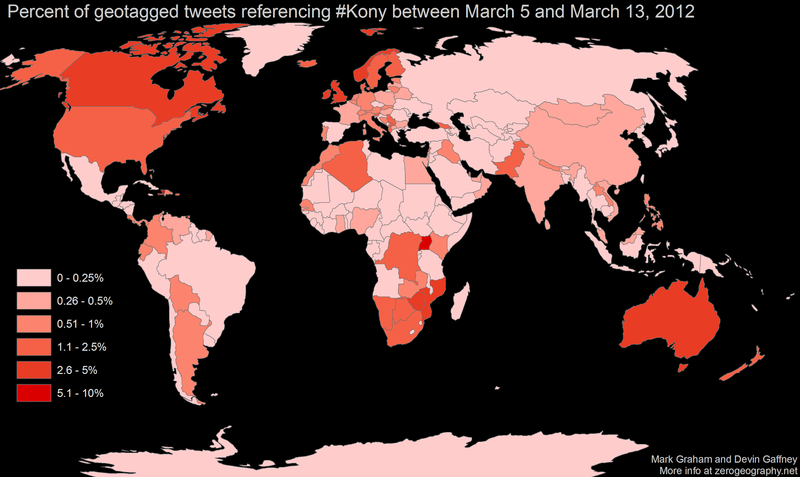 The map below was made by collecting all georeferenced tweets containing the terms "#kony", "#kony2012", and "#stopkony" between February 28 and March 13. It is important to point out that we're only dealing with geotagged tweets here (which account for less than 1% of all content pushed through Twitter). We also are missing data from some of March 11 due to our script breaking down (so interpret the data from that day with particular caution). Nonetheless, the map still does give us a rough sense of where and when the debate (on Twitter) was taking place. 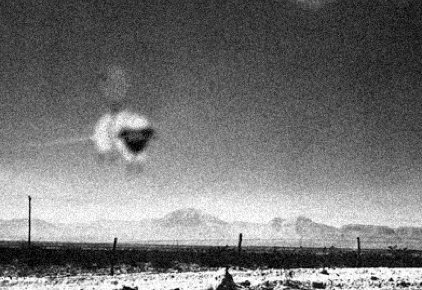 We start by seeing a small amount of discussion in the U.S., that quickly spreads to Western Europe (especially the UK) on March 6. By the 7th, the conversation in North America and Western Europe has become much more dense and widespread. We also see people in Asia, South America and Africa joining the discussion. Then, from the 10th onwards, the intensity of mentions of Joseph Kony on Twitter starts to die down throughout much of the world. The results that we see here are perhaps not that surprising, but they do allow us to trace some of the temporal and geographic contours of a much debated social and political moment in the Internet's history. #Kony's moment of visibility was both brief and largely transatlantic. This Western-centric pattern of information flow is not necessarily surprising and can be found on many other online platforms. 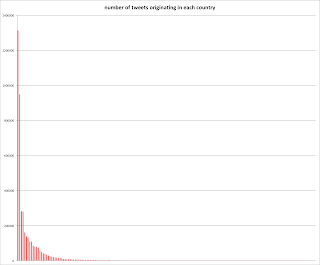 However, given the video's relevance to East Africa, and the global diffusion of Twitter (e.g. 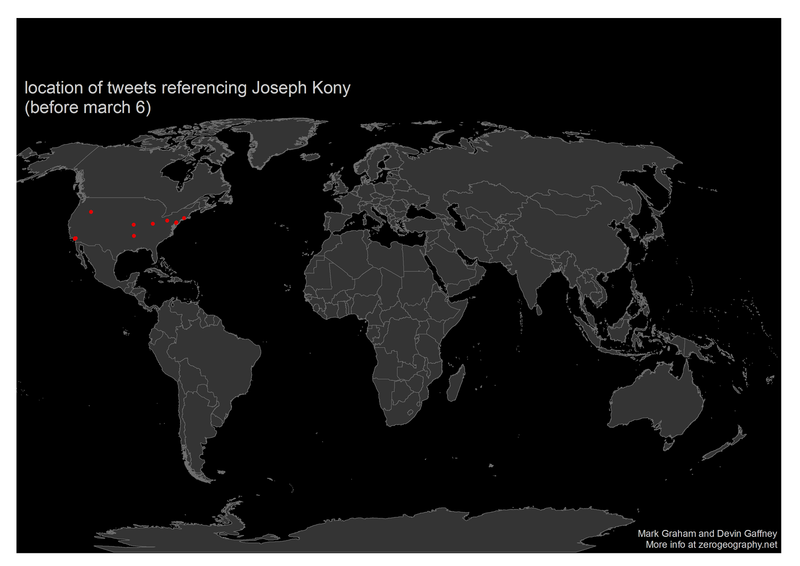 Indonesians form the world's 6th largest population of Twitter users), we might have expected #Kony to have a slightly less clustered geography. I'll soon try to make some graphics that map Kony-related tweets as a proportion of the total number emanating from each country. Doing so might give us a better sense of how prominent the narrative was in the consciousness of Internet users in each country. Team Mutton at IronSheep 2012 won the "Best Map" (Sheep of Dreams) trophy for their truly terrifying vision of the sins of sheep. And yet Team Mutton's presentation also contained a kernel of hope, in short, a guide to the sheep of the world on where it was simply best not to tread. But first some reflections on how to best compete. By now, you’ve probably heard that Team Mutton took home the “Sheep of Dreams” prize for having the best series of maps at Iron Sheep 2012. I’ve been asked to add some of my reflections on “process,” so I thought this might be best framed as “the process of winning.” Academic mapping and lightning mapping for entertainment are two very different sheep. 1. You are no longer in academic space-time. Three hours is not a lot of time for anyone. Traditionally motivated research questions were quickly tossed aside. “How can we make the world safe for sheep?” quickly devolved into “which of these datasets are point values?” and “how can we get chupacabras into this somehow?” You might critically suspect that we may not have heeded the competing epistemologies embedded in the data’s production and that this might have affected our geovisualization efforts, but we don’t have time for that. See rule #1. 2. Get Lize Mogel on your team. Seriously. Her illustrations are what made our maps funny. They also created a compelling narrative that tied together the diverse datasets we accessed. Kernel-density mapping of point data isn’t that exciting, and adding additional illustrations to cartographic work is historically a crowd-pleaser. This probably gets you thinking about the power of the narrative in mapping and the various ways that counter-mapping can critically engage a public without relying on high levels of technical expertise, but knock it off already! See rule #1. The Seven Deadly Plagues (Of Sheep) will show up right before the second appearance of The MUTTON as told in the prophecy of the Silence of the lamb. Just those sheep that can avoid the deadliest areas will survive“ … and that‘s why spatial analysis was invented. Most of the plagues will come as single spatial events in an uneven distribution over space. The more events are around you (as a sheep), the more likely you‘ll be dead. So Kernel density estimation is the key to the knowledge, where to go. The maps show a rough calculation of each of the distributions of plagues, where dark areas are the most deadliest ones. Note, that is is "of" not "with". We know by now that all online platforms have distinct, and highly uneven, geographies. Wikipedia is no exception. The team at TraceMedia, as well as the Oxford Internet Institute's Mark Graham and Bernie Hogan, therefore decided to make a tool that would allow people to explore what, and where, is represented in the world's most popular encyclopedia. The tool is built as part of Mark and Bernie's project to study participation and representation on Wikipedia in the Middle East and North Africa. It currently allows you to explore the geography of all geotagged Wikipedia articles in Arabic, Egyptian Arabic, English, Farsi, French, Hebrew and Swahili. It also allows mapping of a range of metrics including the word count of an article, date created, number of authors, and number of images. 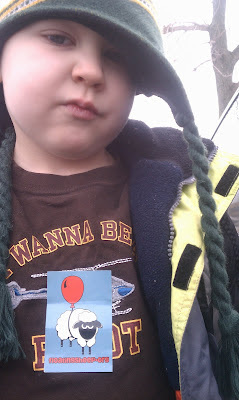 Here is an initial sampling of sticker pictures from around the world, we hope to see many, many more. So please send your pictures in, we'll post all that we get. And to make things a little more interesting we propose that readers play a little FloatingSheep Bingo Rules:- Standard bingo rules apply, first person to connect five spaces in a row (vertically, horizontally or diagonally) wins.- Only pictures posted at the Floatingsheep.org website count but that means as soon as they post, everyone can use them.- The first person to email in an appropriate photo gets credit for that square.- The person with the most credits for the squares making up the winning connection is the winner and will receive a floating sheep ornament for all their holiday decorating needs.- If no one actually plays, we'll just award the ornament to our favorite photo.Need some stickers? Send me your address and I'll mail some out (zook [at] uky [dot] edu).